A meteor or “shooting star” is produced when an interplanetary dust particle (meteoroid) enters the Earth’s atmosphere and deflagrates, leaving a train of excited and ionized particles along its path. If sufficient light is produced by the subsequent de-excitation, as well as various ionic processes, the meteor may be observed visually. Meteors can also be detected using techniques that rely on the scattering of radio signals by free electrons in their wakes. The typical visible meteor is about the size of a grain of sand; a meteor the size of a grape produces a very memorable fireball. If you have seen a fireball, please report your sighting. In general, meteors appear in the upper atmosphere, at an altitude of between 80 and 120 km and disappear between 60 and 80 km above the Earth. Many meteors are sporadic, but many more are members of showers. The origin of sporadic meteoroids is still uncertain. They are probably very minor streams of low particle density, the remains of minor streams that have long dispersed, as well as solitary particles travelling in isolation. Under ideal conditions, about 10 sporadic meteors can be seen per hour. A meteor shower occurs when the Earth intersects a stream of meteoroids that has formed as a result of the disintegration of a larger body (usually a comet but occasionally an asteroid). Thus each shower recurs at the same time each year, and the meteors seem to radiate from a point (the radiant) corresponding to the direction from which the meteoroids approach the Earth. Most meteors vaporize during their descent, but a few survive and strike the Earth and are called meteorites. Once a meteorite lands on South African territory it belongs to the State (Act 25 of 1999) and is protected by the South African Heritage Resources Agency. Trading in South African meteorites is illegal. A number of significant meteorite falls have been recorded in southern Africa. The world’s largest known meteorite is the Hoba Meteorite in Namibia. The most recent meteorite fall in southern Africa happened on 2002 July 21 at Thuathe near Maseru in Lesotho. 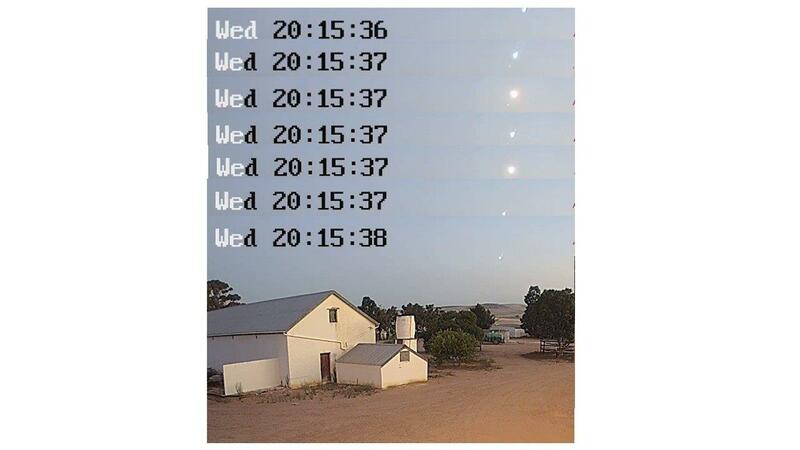 The event was witnessed as a daytime fireball from Johannesburg and the Free State. At least 500 fragments were recovered with a total mass of about 30 kg. It is estimated that on entry the meteoroid weighed about a ton. Recommendations for meteor showers to observe during the year appear in the Sky Guide. 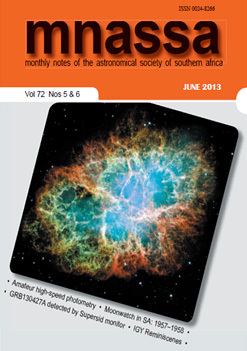 Download a comprehensive observing tutorial by Tim Cooper, “How To Observe Meteors“, as published in MNASSA (2007 June, 113-118). A bright bolide (South African Fireball Catalogue (SAFC) #316) was widely seen over the Western Cape at 20h14m53s SAST on 2019 January 16. It exploded at an altitude of around 46km, was followed by audible noise and vibrations and left a persistent train visible for several minutes. The first person to advise of this event was Kos Coronaios, who said he received reports of a ‘double bang, followed by rumbling’ at around 20h15 SAST. Later that evening and the following morning, we continued to log sightings of the event, as well as two videos and several images of the persistent train left behind by the meteor. The observed duration and speed, and the appearance in the videos are all consistent with a bright meteor. Notably the event was not detected by US government sensors, and therefore was probably less energetic than the daytime fireball which detonated with an energy of 0.1 kT just west of Cape Town shortly after noon on 2013 March 12 (SAFC #249). A rough triangulation from the more reliable eye-witness accounts, and more importantly from images of the smoke train, gives the tentative path shown in Figure 2. The meteor approached from the south descending at a steep angle, moving slightly towards the east, and disintegrated with two explosions just south of the coast between Hermanus and Pearly Beach, probably in the vicinity of Gansbaai. We received a large number of reports from a wide expanse of the Western Cape, of which 42 independent locations are shown in Figures 1-3. All sites are plotted, but due to the large number around the Cape metropole not all site labels can be seen. The fireball was seen as far north as Clanwilliam and Lamberts Bay in the north, and as far east as Pearly Beach. Henriette Vermeulen observing from Clanwilliam saw it low on the horizon just east of south and moving diagonally downwards from right to left, while Liza and Pierre Groenewald from Lamberts Bay noted it seemed to move inland towards the east. There was a large number of sightings from Cape Town and surroundings, and most gave the general direction as south-east, moving from right to left. From Welgemoed, Rozanne Groenewald said something ‘went down over Welgemoed Golf Club’ which runs south to south-east of her location. Marius Reitz in Edgemead was setting up his telescope and saw the fireball in the direction of Helderberg, in azimuth about 120°. Several reports from further south and east help constrain the probable path of the fireball. Marg James was walking at Lagoon Edge east of Hermanus when she saw it to the south east and thought it might land in the lagoon. Others in Hermanus said it seemed to be heading for Gansbaai, and Kate and Steve Klopper in Fisherhaven said ‘it came right over our heads’. Jaco and Chloe Koekemoer at Onrus said they saw it to the south of them, from which description of the path I take the meteor did not cross the coast. Even further east, Sonja Rademeyer saw the meteor from De Kelders and said it looked like an emergency flare shooting towards Gansbaai. On the other side of the mountain at Franskraal, Cecelia Diener saw it moving northwards towards the mountain side. The most easterly sightings were from Pearly Beach, where they saw the meteor looking in a westerly direction, and moving left to right. This would seem to indicate the path was headed north east somewhere between Hermanus and Pearly Beach. Video footage from cameras such as security cameras and dash-cams can be extremely useful in determining the pre-atmospheric orbit, and also the potential fall site for meteorites from large bolides. However, this requires precise knowledge of the location of the camera used to take the footage. Two videos were posted on social media, both of which showed the actual passage of the meteor, either directly or indirectly. The footage from a security camera near Malmesbury (Figure 4) is the best visualisation of the appearance of the meteor. The meteor enters the field at upper right and descends at an angle of 30° to vertical from right to left looking roughly south. The duration of passage is less than two seconds from entering the field of view until the meteor burns out just above the horizon, and in that time two bright flashes are clearly observed separated by less than 1 second. The total time of flight of the visible meteor is indeterminate seeing that deflagration was already underway when the meteor entered the field of view. The second video is from a security camera overlooking a swimming pool in a residential property, and the meteor is seen in reflection on the water for a very short section of its passage. Despite the efforts of the authors, the precise position of neither video cameras could be determined at the time of writing, so we are unable to derive any accurate measurements of the trajectory of the fireball. One further video was received from Guido Di Giannatale which showed the bright flashes inside a residential property, and the reaction of an animal to the sound of the explosions. Since the camera time stamp was synchronised to internet time, we determined the appearance time of the bright meteor as 20h14m53s. This was followed 136 seconds later by the loud explosions, which would indicate disruption may have occurred at an altitude of around 46km. In the absence of astrometry from the videos, we were able nevertheless to derive some tentative measurements from images of the persistent train left in the path of the meteor. Four images were received showing the meteor descending in different directions depending on location of the observer, and are summarised in Table 1. Table 1 Locations of observers who submitted images of the persistent train, in order from most westerly to most easterly. Note sites 17 and 42 are separated by only 2.1 km. Descent angle is the angle to vertical. From interviews with the observers we ascertained the direction faced, and the differences in direction infer the meteor passed between these locations. So for example, Sites 17 and 26 were looking east and saw the meteor descend towards the left, while Site 22 was facing west and saw the meteor descend towards the right. The image of Jacqueline Keulemans from Gordons Bay is particularly useful in that it records the train along with a discernible mountain skyline. A projection of the path in her image gives an intersection with the ground in azimuth 152±2°, which is just south of landfall at Gansbaai. The image of Riaan Potgieter did not show the horizon, but he was able to point out the positions of the two bright bursts in the train relative to local landmarks, from which I measured azimuths as 144° and 120°. Close by in Vermont, Janeke Maroudas took her image around 10 seconds after the visible fireball, and from her direction I measured an intersection with the ground in azimuth approximately 144°. Analise Kleyn’s image further east is the only one in which the train is from left to right as she saw it, which constrains the path to the west of her location. The azimuth directions derived from these train images are shown in Figure 3, and while there is some discordance, the possible footprint of disintegration is narrowed down to the area shown. Those who witnessed the visible passage of the meteor described a glowing ball with a tail, moving quickly, with at least two bright flashes and leaving a trail of smoke which persisted for several minutes. Aldiana Kotze saw a big ball of red orange flames, while Ree du Toit said the head looked like a very big teardrop, and Rozanne Groenewald said it looked like a teardrop with a long burning tail. These descriptions appear to agree with the montage of images in Figure 4, which shows the appearance at various stages in its path as seen from Malmesbury. The total duration of the visible passage is difficult to determine, as the meteor had already started the process of deflagration before its two bright flashes, which are what seemed to catch most people’s attention. The meteor had already begun its visible passage before it entered the field of view in the Malmesbury camera footage, and lasted less than 2 seconds before burning out. Several persons gave estimates of the duration, from 1-2 seconds up to about 7 seconds. The real duration is probably somewhere between these two extremes. Exactly half of the reports gave descriptions of colour. The most often mentioned were white (30%), yellow (26%) and orange/red (30%). A small number mentioned seeing blue and green. The colours seen in the vicinity of the path were exclusively bright white or yellow, and all those who saw other colours including orange, red, green and blue were located in the Cape Town area. ‘Suddenly, out of the corner of my eye, I saw a blinding gold-coloured flash in the direction of Gansbaai. I was facing east. Immediately after the flash, I saw what looked like an extremely fast moving object…Looking at the contrail, I noticed that it was fairly thin, at that time thinking that it was actually smoke from a flare. The contrail stayed visible for about a minute and a half. The thickness of the trail also threw me off, since it was very thin. The wind quickly ruined the straight line and within seconds it was only a smear of a squiggly line left in the sky. The contrail was actually really high. It wasn’t exactly above us, it was more south, likely over the ocean. It may have seemed as if it was only a little bit South, but due to the height of the contrail, it was likely more south than what it seemed. The appearance of the train is well seen in the images taken by Riaan Potgieter (left) and Analise Kleyn (right) in Figure 5. 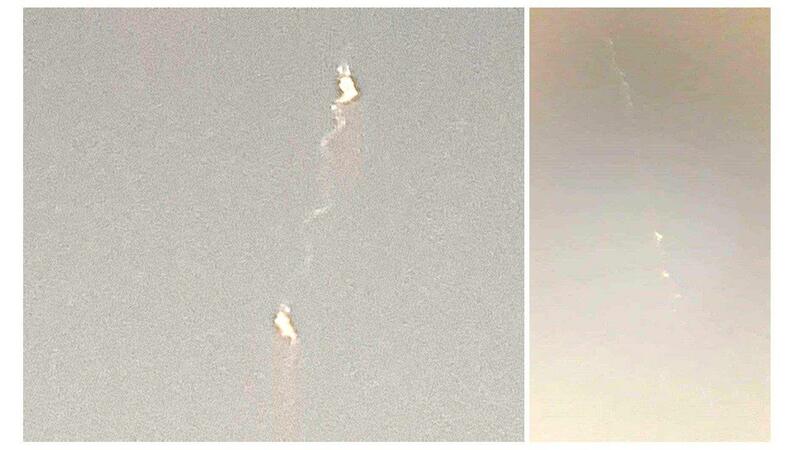 We enhanced the images to accentuate details, which clearly show the two bright spots coinciding with the explosions and the apparent cork-screw appearance of the trail. The visual meteor was followed by audible sounds and vibrations in the vicinity of the path. Observers in Cape Town and surroundings did not mention hearing any sounds, and some even specifically commented that no sounds were heard, though any sounds would have taken some time after the visible meteor to reach those locations. The furthest location from which sounds were definitely reported was Franschhoek, where Ian Newton said he heard ‘what sounded like a sonic boom’ several minutes after the meteor. Nearly all the sites around Hermanus, Gansbaai and Pearly Beach experienced effects. From Hermanus, Marg James reported ‘a loud rumble like thunder’ about a minute later, Louis Loubser said he thought it was an earth tremor, and Riaan Potgieter saw the meteor while walking his dog, and just over a minute later heard a loud ‘boom’ which caused people to come out of their homes. Also from Hermanus, Guido Di Giannatale recorded the time of the flash on a CCTV camera, which was followed by sounds ‘like a sonic boom’ 136 seconds later. From De Kelders, Annalise Kleyn imaged the smoke train and 15-20 seconds later heard sounds ‘like loud thunder and felt like shaking’. In the same area Sonja Rademeyer said she heard a ‘loud bang like thunder and it felt like an earth tremor’. From Pearly Beach, Sarah Coronaios was outside and reported ‘two explosions very close together, followed by low rumbling for about 8 seconds, much like a flat tyre on gravel’. Barnie Huysamer said shortly after the flash he heard rumbling which lasted about 15 seconds, and Retha Vos heard ‘rumbling like thunder, but almost as though there were two explosions’. From the available reports, we conclude a meteoroid approached from the south of the country and entered the atmosphere at 20h14m53s SAST at a steep angle to the east of Hermanus, probably close to Gansbaai. The bolide underwent two disintegration events separated by less than 1 second at around 46km altitude, resulting in two bright flashes of light, left a persistent train visible for several minutes, including two bright clouds where the disintegrations occurred, and was followed by audible sounds with two explosions, rumbling like thunder which caused windows and ground to shake. 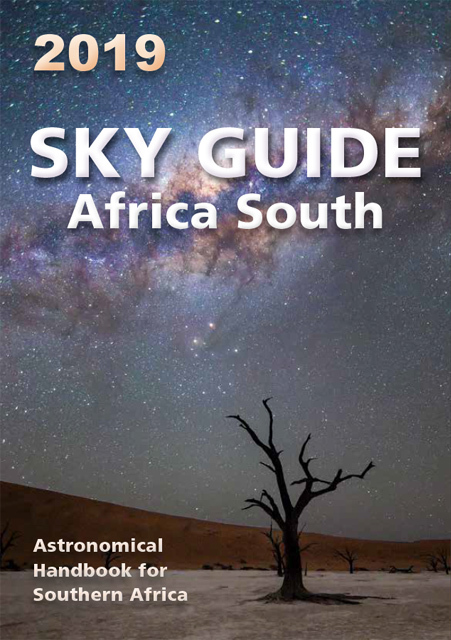 The authors would like to thank Dr Daniel Cunnama, SAAO, for several reports submitted via the SAAO website. Figures 1-3 courtesy Google Earth. Figure 1 Locations of all 42 observers who provided reports and images. All sites were plotted but due to congestion in the Cape Town area and suburbs, not all site labels are visible. Figure 2 Locations of observers in Cape Peninsula and southern Cape coast, with possible path of the bolide indicated as a yellow arrow. Figure 3 Locations of observers in vicinity of the path. 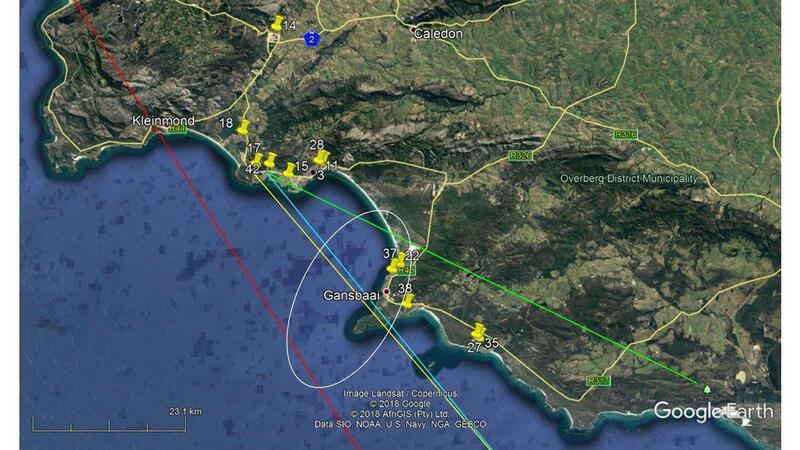 Azimuth directions derived from images of the smoke train are shown as follows: Red line is the azimuth of intersection with ground level from Jacqueline Keulemans at Gordons Bay, yellow line is the azimuth of intersection with ground from Janeke Maroudas at Vermont, blue and green lines are azimuths of the two bright bursts from Riaan Potgieter at Onrus. The white ellipse indicates the rough area in which the meteor probably disintegrated. Figure 4 Sequence of frame grabs from Malmesbury video footage. Top frame is the first appearance of the bolide at upper right. The third and fifth frames show the two explosions. Last frame is immediately before the bolide ceases to be visible. In some frames at least three fragments are visible. Note total flight time in the Malmesbury video is just under 2 seconds, and the two explosions are separated by less than 1 second.